Gerald Farm was born on March 8, 1935 in Grand Island, Nebraska. He received his BA from Kearney State College in 1961, after serving four years in the Navy as an illustrator in the Art and Animation Department of the Naval Photographic Center in Washington, D.C. 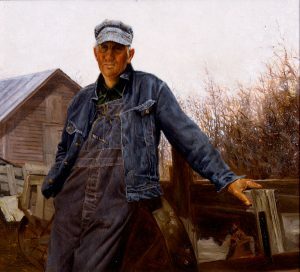 While serving in the Navy, Farm managed to graduate from the Famous Artists School in Westport, Conneticut. Since 1954, he has visited many countries in search of subject matter including: Mexico, Spain, France, Italy and Africa. He traveled extensively throughout Europe in 1976 to study the work of the old Masters. In 1961-2, Farm taught high school art in Loveland, Colorado then went on to become Art Director for the Hewiett Packard Company. After seven years, he and his family moved to Farmington, New Mexico to allow Farm to focus on his artwork full time. The subject matter found in Farm’s oil paintings consist of scenes and portraits of American Indians (Navajo and Northern Plains tribes). He is often referred to as the new Norman Rockwell because his paintings often tell a story about the subjects and include detailed landscapes and scenes. His name is listed in Who’s Who In American Art, American Artists of Renown, andContemporary Western Artists. In 1992, he got the Peter Hassrick Merit Award, Western Rendezvous of Art. He is currently resides with his wife Sharon in New Mexico.